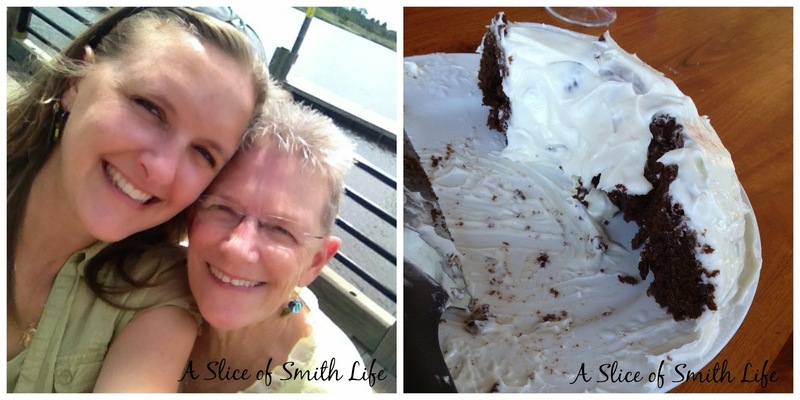 Sunday, August 24, I turned another year older wiser! :) I had a lovely day with my Mom eating out for lunch at a quaint restaurant downtown where we live! When I got home from my lunch date, my hubby and Cupcakes were busy cleaning, cooking and decorating for my birthday. It was a delicious meal and the homemade chocolate cake with homemade cream cheese icing was so good! I realized forgot to take a picture of the cake until it was half gone! 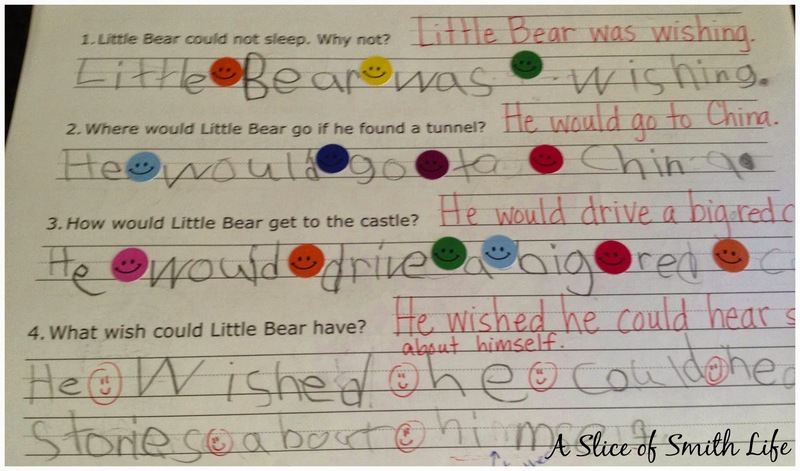 I'm using Memoria Press 1st grade lesson plans for my 6 year old daughter for this year's curriculum and on one of her assignments this week she had to answer questions about Little Bear. I noticed that her spacing between words was a bit crowded so I told her to think about being able to draw a smiley face in between the words. We want "smiley spaces". If the spacing was good, the smiley face fit and was well, smiling. But, if her words were too close together I drew in a frown face. That seemed to do the trick because on her next page she had smiley faces all over the place :) I used both stickers and drew in faces with a red pen. There are many reasons I haven't been blogging as regularly as I would like to, but one reason is that I've used the past several "kid-free" hours (late at night) to work on a Picaboo photo album from our trip to Disney that we took this past May. A birthday gift that my husband gave me last Sunday was time for me to start the album while he watched our Cupcakes. It was so nice to work on a project in the afternoon vs. late at night when I'm half asleep! I'm grateful for all my Disney blog posts because I'm basically uploading the same pictures and journaling from my posts into a Picaboo album. I don't know if you have ever created one of these albums, but I love the finished products, although there is never enough hours in my day to get one done in a timely manner! 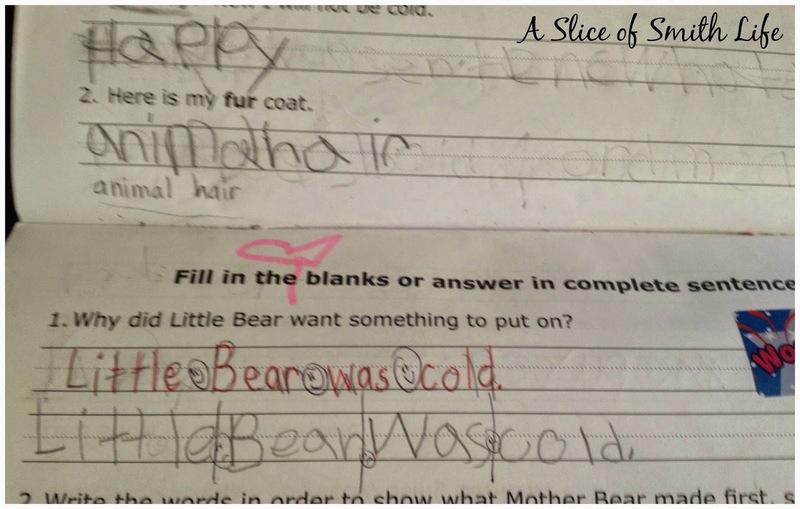 I had a few bad days this week during our homeschool lessons with one "student" in particular. It was rough and it left me wondering, "What in the world am I doing trying to keep my sanity while homeschooling these little people of mine?" But, we worked through the rough times and I'm happy to say that today was a good day, especially since my Cupcakes were excited to make these lava lamps from their Apologia Chemistry and Physics text. This is the same text we used when we made the layers of food coloring in the plastic straw. This experiment was a lot of fun and easy to do! 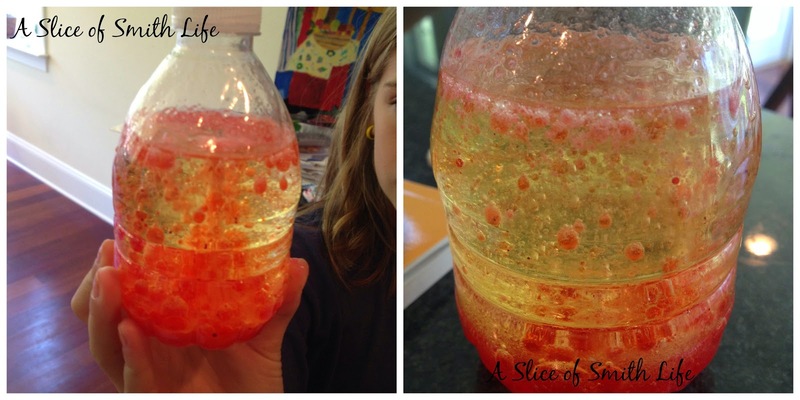 With vinegar, vegetable oil, food coloring and an Alka seltzer tablet, you can make bubbles in a bottles to look like a lava lamp. Our family has a busy weekend this weekend starting with a homeschool soccer game against a local private school team on Friday afternoon. My son plays soccer while my oldest daughter runs cross country. 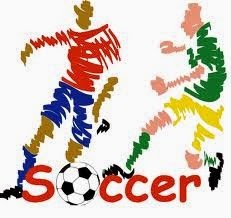 In our area was have a homeschool sports association (this is their 3rd year so its fairly new) where homeschool kids can play various sports like soccer, cross country, volleyball, basketball, tennis, and baseball. The homeschool teams play various private schools in our area. It is a great way to get our homeschool communties to network and get to know one another, as well as learn the importance of being on a team. My oldest daughter is running cross country with a local homeschool team and she has her first race on Saturday morning. It's a 5K race and she says she is nervous. I'm a little anxious for her too. We have been running together in the evenings and weekend to train. I'm not sure if I will run with her or not because I really need new running shoes. I think the current pair I'm wearing was the pair I bought soon after I ran my first half marathon back in March 2012. Yikes! My shoes have holes in them and the tread at the bottom is worn, but I haven't found the time to go shoe shopping for myself! I hope that day comes soon! I think my feet and body will thank me for new running shoes! This Sunday after Mass our homeschool group will volunteer to feed the homeless. Whenever there is a 5th Sunday in the month, our group volunteers to make the food and serve those in need. We have been doing this ministry for several years now and it's always a blessing for us and so many. Then Sunday afternoon we are hosting a birthday celebration for our parish priest whose birthday is actually on Sunday. We are looking forward to the fellowship with friends and local homeschool families to celebrate and support our local parish priest. Happy Birthday! I know well the agony of the running shoes...for me it's not always running shoes, sometimes it's just clothes because I forget to save some money for myself or buy fun family things with money gifted to me for birthdays and holidays. Thank you Billie Jo! We are enjoying the Little Bear stories as well! I'll have to check out the video versions! Thanks for stopping in to comment! I understand what you are saying and my problem is also not finding the time to go out and buy things for myself! :) Thanks for stopping in to comment!